Most of us have always been aware of peak vs off peak electricity rates from utility suppliers. The same principle with people who have solar systems applies. The way in which we use our appliances has a direct effect on the money that we spend on electricity. By shifting the times we use appliances to align more with the availability of the sun, we can see significant reductions in our electricity costs. This information applies to all forms of solar users whether grid tied or off grid as the term electricity costs can be defined as either what you pay to the utility provider as a grid tied customer or what you deplete from your battery bank capacity as a off grid power user. 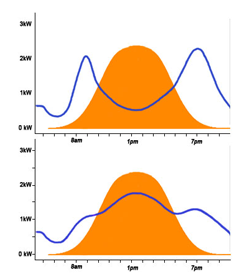 So to describe the savings in more detail using the info graphics above, in the charts you will see the orange suns bell curve which represents the sun coming out in the morning and going down in the evening. The blue line represents two examples on how households use electricity. The areas below the blue line are the costs of electricity either paid to the utility or depleted from your battery bank as mentioned above. In the first chart, you will see the blue line energy usage with two distinct peaks. The first peak being the morning when we wake up, cook breakfast, put laundry on, do house cleaning, put the dishwasher on etc. The second peak is when we arrive home from work when we may also do more laundry, ironing, make dinner, watch tv, vacuum, run the dishwasher etc. Most people would say well yeah that’s all right and good but I am not home during the day to do these things. The answer to that lies on various different things you can get to automatically switch things on and off like timers or if you want more control, remotely activated switches that work over your internet connection. Or if you don’t want timers or technology to control your appliances, simple techniques like waiting to do your laundry until the weekend when you are at home during the day or ironing your work shirts when the sun is shining on the solar panels can really go a long way. Other potential tips you can do to help shift the use to the day when the sun is out include putting a timer on your pool pump to only run between the times of 8am and 7pm. Maybe also programming or adding a timer to your hot water service to mainly heat up during the day depending on your usage. So by altering the way in which we use our appliances we see that we can have a direct effect on the way we spend on electricity.